The Bay of Islands is a beautiful region of New Zealand that has an amazing subtropical climate. Only three hours from Auckland, the Bay of Islands has so much to do and Paihia is one of the best bases in the region. If you’re looking for the best things to do in Paihia, look no further! Disclosure: I travelled New Zealand for five weeks with Kiwi Experience on an unpaid partnership. All opinions are, as always, my own. Paihia is a three hour drive north of Auckland or a 50-minute flight to Kerikeri followed by a 20-minute drive to get to central Paihia. I travelled to Paihia with Kiwi Experience as part of the Bay & Cape add-on. The trip begins early in Auckland and travels to Paihia on your first day via Whangarei Falls, giving you a full afternoon in Paihia. The next day you can do a day trip to Cape Reinga and then choose whether or not you wish to stay in Paihia for longer. The journey back to Auckland doesn’t leave until early afternoon so you can also spend the morning exploring more of Paihia or nearby Russell or Waitangi. 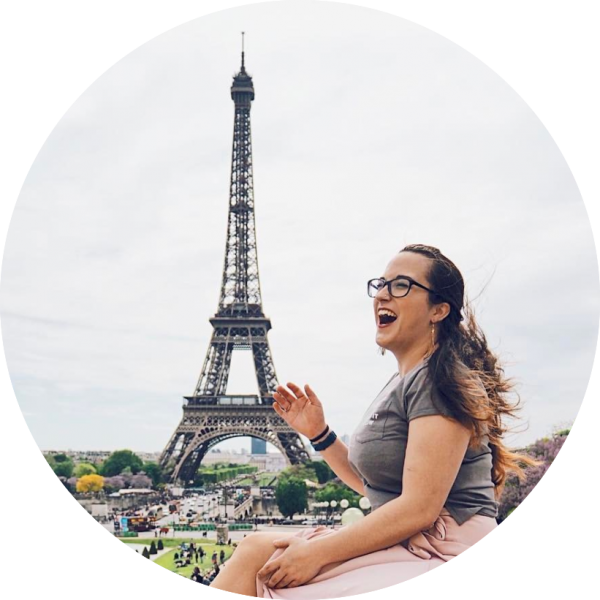 While travelling New Zealand, I only stayed in hostels as I wanted to keep my costs down and get a true backpacker experience! I highly recommend Pipi Patch Lodge (also known as Base Bay of Islands) – the rooms are clean and comfortable, we had an ensuite bathroom and there is also an on-site pool and a hot tub. The hostel bar has a nightly barbecue and also great drink deals! If you’re looking for more luxury, then don’t miss the modern Pioneer Waterfront Apartments or the 4-star Scenic Hotel Bay of Islands. After I checked in at the hostel I went to locate coffee and a bite to eat. After a short walk I found El Cafe, a lovely little cafe restaurant not far from the hostel. My late lunch consisted of delicious pulled pork quesadillas and a soy flat white (if you didn’t know, the flat white was invented in New Zealand – a smaller coffee than a latte and with steamed milk rather than frothed). I highly recommend a visit to El Cafe when in Paihia – I went at least three times in the three days I stayed there! The pier is the perfect spot to watch sunset (or sunrise!). The sun will set behind the mountains but you still get some spectacular sunset colours and if you’re sat on the pier you can see over to the mountains and watch the sun gradually set behind them. Head out for sunrise to watch the sun appear from the horizon across the bay or – on a clear day – you might even be able to see across to Russell. Whether you watch sunset or sunrise, don’t miss out on this great thing to do in Paihia! Pizza Shack was recommended to me for dinner (pizza, obviously) but I ended up getting a toasted sandwich next door at Vinnie’s Takeaway as I wasn’t hungry enough for a full meal. However, Pizza Shack has an amazing selection of craft beers so I just had to visit after eating. I enjoyed a delicious New Zealand porter from McLeod’s Brewery, a microbrewery in Waipu. Definitely make sure to stop by if you’re a beer connisseur! After lunch, it was time to head off to the pier to catch my boat for the Hole in the Rock tour. 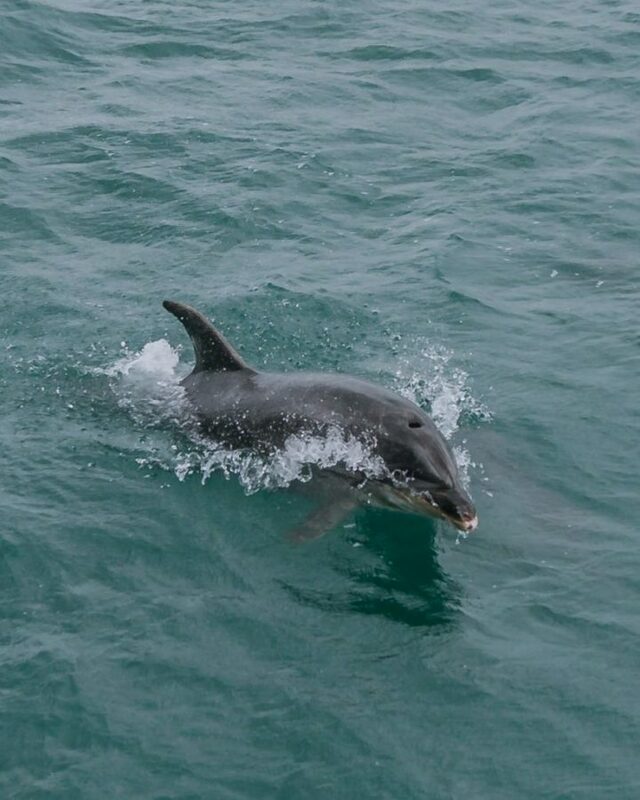 This 3-hour catamaran cruise departs from Paihia and Russell and takes you along the Rakaumangamanga Peninsula (Cape Brett), where you can catch a glimpse of the Cape Brett Lighthouse and maybe even some dolphins swimming around your boat! The cruise then continues to the ‘Hole in the Rock’ or Motukōkako as it is known in Māori. 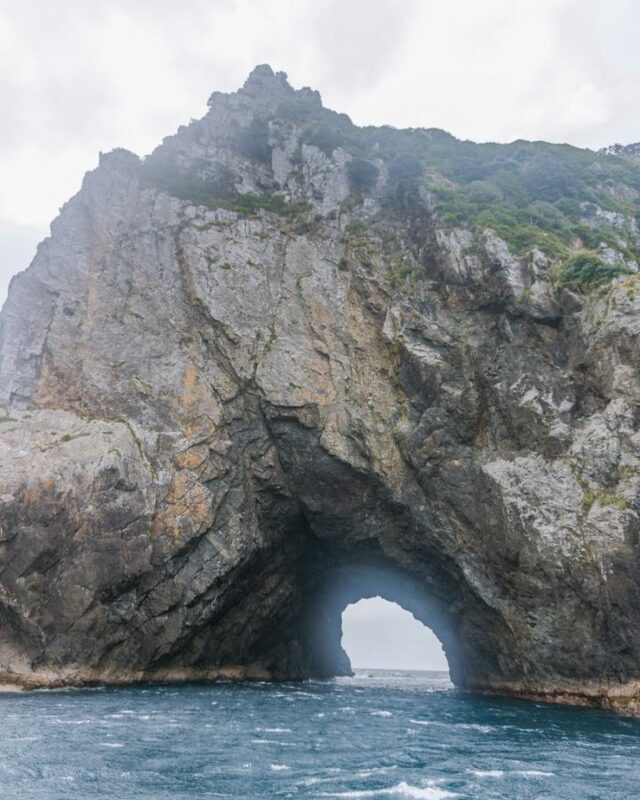 Depending on the weather, your captain might be able to sail the boat through the hole in the rock as Māori warriors did before heading off to battle. It was said that if water from the cave dripped on a warrior then that was a good omen! Unfortunately for us, the sea was too choppy for us to sail through the Hole in the Rock, but the views from afar were still impressive and you can see why the island is of great significance to the Ngāpuhi iwi (local Māori tribe). 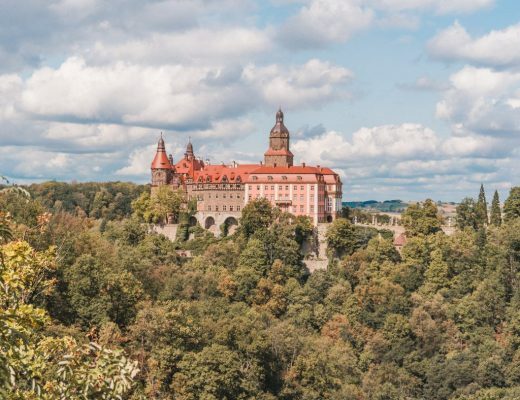 Read more about going on the Hole in the Rock cruise in Destinationless Travel’s article! 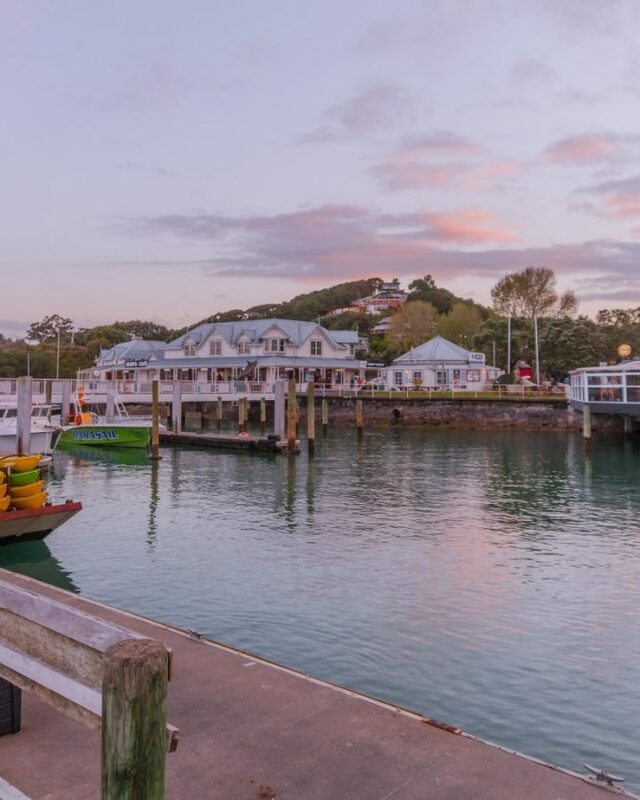 You can also get off the boat in Russell and then take a ferry back over to Paihia later that evening – your ticket includes the ferry back over if you choose to do so! Russell was actually once known as the ‘hellhole of the Pacific’ thanks to being one of the first European settlements in New Zealand (many of whom had come over from the penal colony of Australia) and becoming known as a community without laws and full of prostitution. However, it is now a much more pleasant town of cafes, B&Bs and beaches to enjoy the sunset from. While I didn’t manage to visit the falls myself due to a lack of time, some of my friends did make the trip. You can either go on a 2.5 hour bush walk to reach them which includes walking along the boardwalk through a mangrove forest or, alternatively, you can kayak there instead. 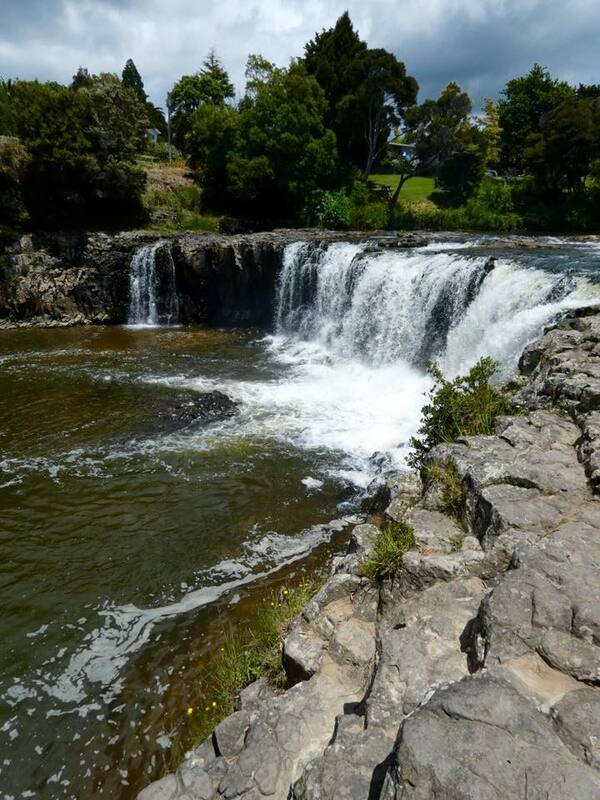 Bay of Islands Kayaking offers tours to Haruru Falls by kayak, which one member of my group did and loved. The 3-hour tour costs NZ$85 and includes all the equipment you’ll need – just bring a bottle of water, a towel, a change of clothes, sun protection and a camera. For water activities, I love my GoPro HERO. Don’t forget to buy a floaty so if you drop it in the water it doesn’t sink! Opua Forest is located just behind Paihia and is about a one-hour round trip from the town to the Opua Forest Lookout, which provides great views over to Waitangi and Russell. The Opua Kauri Walk also offers a short, easy walk through the kauri trees. Kauri trees are only found in the north of North Island and can live for over 1,000 years. 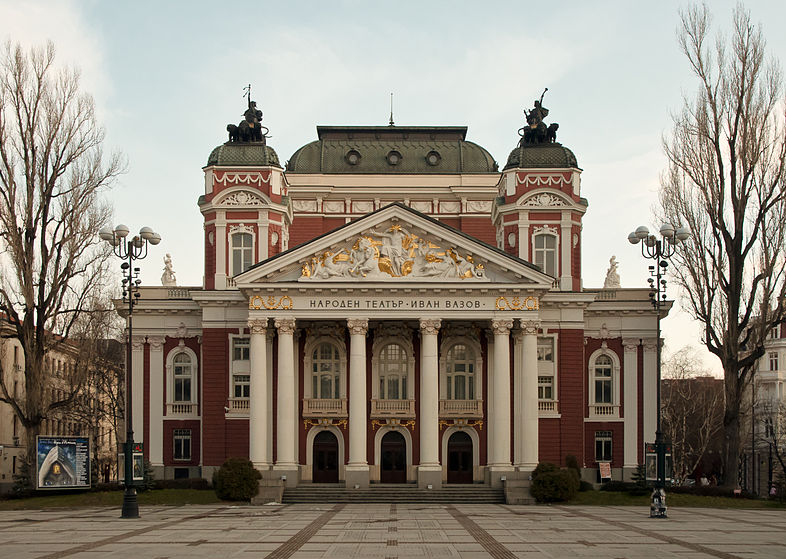 They can reach 40-50m tall and trunk diameters of over 5 metres. They are a native species to New Zealand and due to logging have severely dwindled in number over the last few hundred years. You will find pockets of regenerating kauri forests around Northland so definitely don’t miss visiting a forest when you’re there! If, like me, you want to learn about the Māori culture and the history of the Polynesian explorers then you should definitely visit the Waitangi Treaty Grounds. The walk from Paihia takes only about 30-40 minutes. 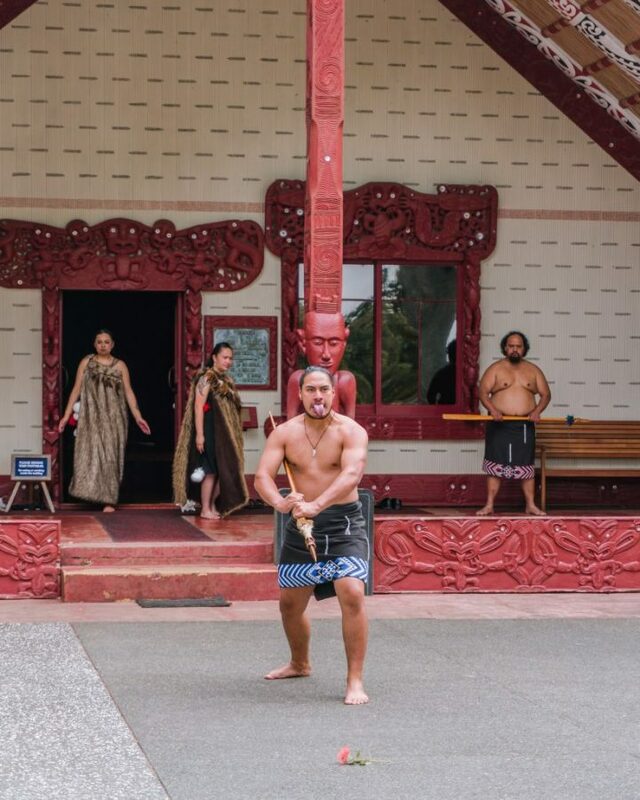 Entry to the Treaty Grounds costs $50 (or $25 if you are a resident of New Zealand) and includes a guided tour around the grounds, a Maori cultural performance and entry to the museum. 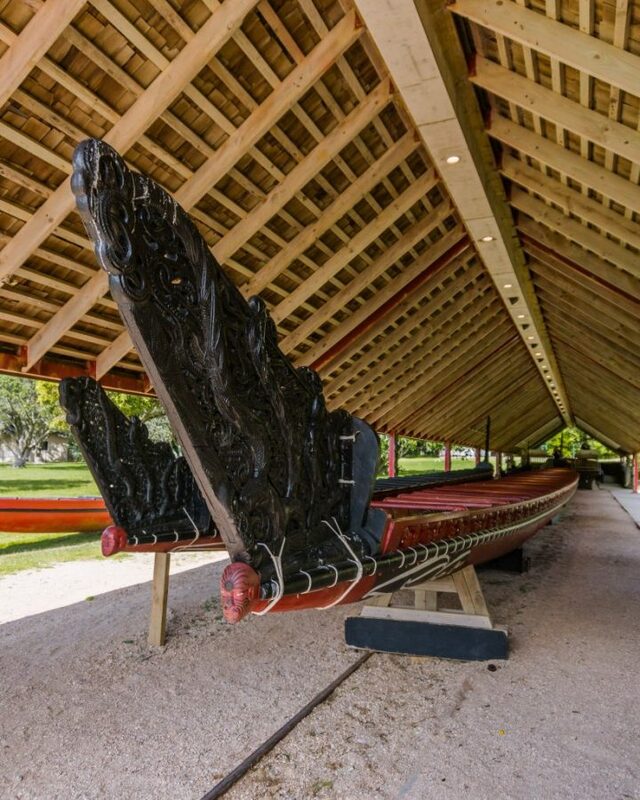 You will have access to the grounds for the entire day, including the world’s largest ceremonial war canoe (Ngātokimatawhaorua). For me, learning about the treaty gave such a great insight into the history of the Maori people and what it was like for them when the ‘white man’ turned up. Your guide will explain why the treaty is still somewhat contested (differences in phrasing between the English version and Maori language version) and what that means in practice. 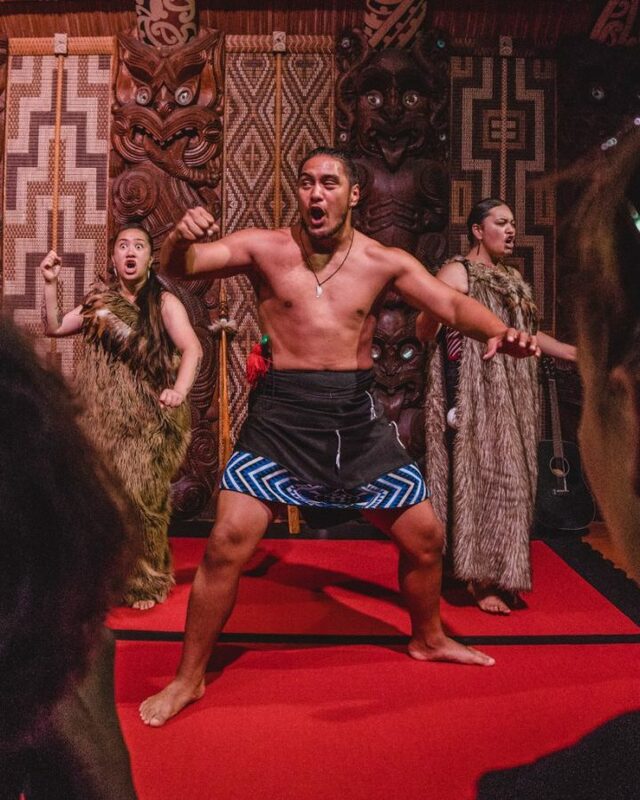 Also, the cultural performance including a traditional Maori welcome is a must-do! Whether you choose to stay one day, two days or more in Paihia, there is definitely lots to keep you occupied on your visit! 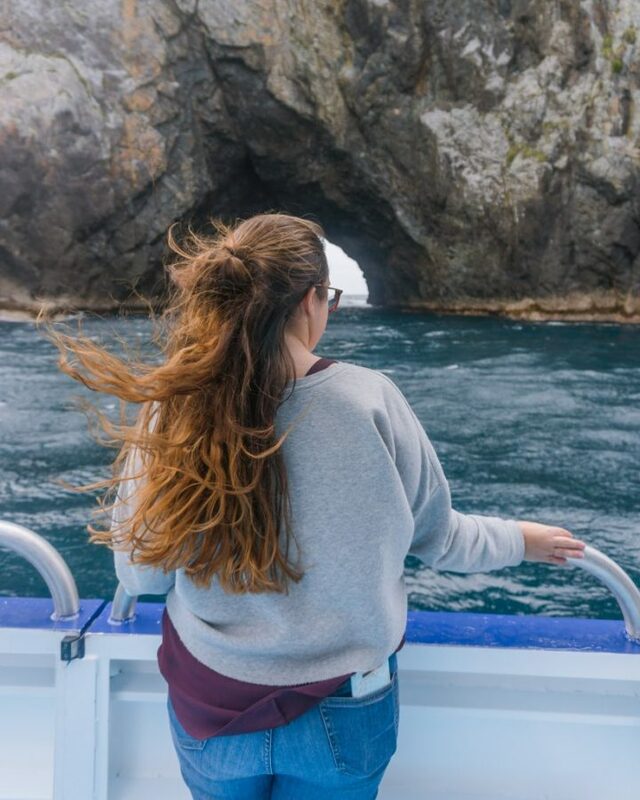 I had an incredible time on the Hole in the Rock cruise (particularly since we spotted dolphins) and a visit to the Waitangi Treaty Grounds is a must-do if you’re interested in New Zealand history or Māori culture. Looking to book a New Zealand adventure with Kiwi Experience? 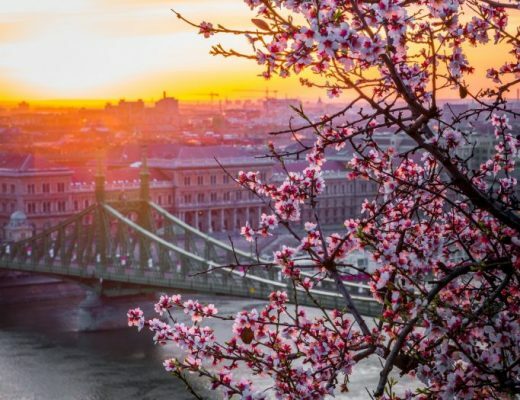 Get 5% off all passes with the promo code KIWIEX_FLYAWAY! Have you been to Bay of Islands? What are your favourite things to do in Paihia? Let me know in the comments!